Joel loads a stack of boxes onto a hand truck and weaves his way through a crowded outdoor market in Kisangani, one of the largest cities in the Democratic Republic of Congo. An orphan who lives with his aunt, Joel doesn't want to be a courier forever. But if he is to have any hope of a brighter future, he must first pass the national exam—the key to better employment and a post-secondary education. And to take the exam, he needs money. NATIONAL DIPLOMA follows Joel and a group of his classmates in the two months leading up to their taking the national exam. Things start off badly, when the high school principal walks into a class full of students preparing to take a mock exam and expels Joel and more than a dozen others for unpaid school fees. Undaunted, the students rent an unfinished house across the river. The floors are covered in debris, there is no furniture, and live wires snake down interior walls. But the teens hammer a blackboard into a brick wall, set a cookstove on the floor, and set about teaching each other algebra, philosophy, and the other subjects they will need to pass. 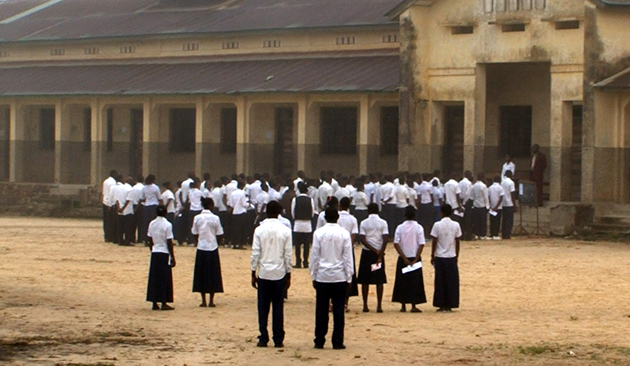 What makes this verite documentary exceptional is its ability to capture telling details: the sign above the principal's desk saying anything is possible with hard work, just before he expels students over fees; girls brushing each other's hair in the downtime between studying sessions; the ecstatic and intimate moments in church and visiting a faith healer, as the students seek any help they can get. As the exam date approaches, the principal visits the students and implores them to return so he can pay the school's staff. Meanwhile, the young scholars have discovered that the key to passing the exam may not lie in studying, but in finding a trusted source who can leak them the answers. Director Dieudo Hamadi grew up in Kisangani and was one of the half a million Congolese students who took the national exam each year. NATIONAL DIPLOMA is a closely observed film that offers no overt political commentary as it chronicles the hypocrisy, anxiety and distortion in a deeply colonial system. A portrait of Colonel Honorine, or "Mama Colonel," that addresses the issue of violence towards women and children in the DRC. Mixes documentary and fiction techniques to recount an African art object's 100 year journey - a whole century of Western attitudes towards African culture packed into 8 minutes! A powerful portrait of Africa's most widely acclaimed contemporary artist El Anatsui.